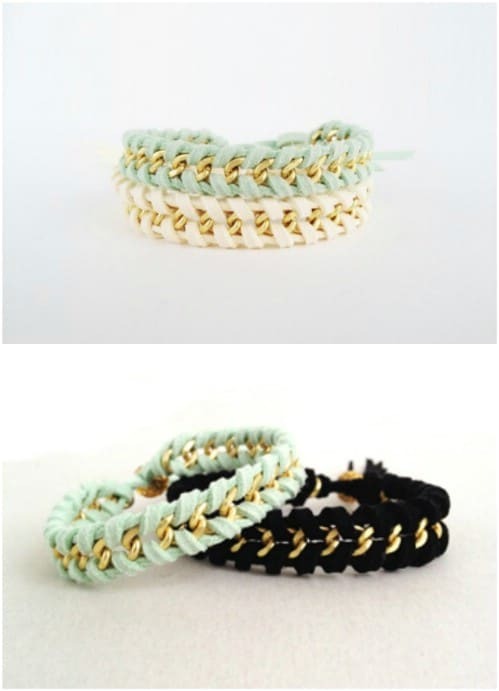 An old gold or silver chain bracelet can be turned into a beautiful summer accessory with a little braiding. Taking colorful suede lace, you just braid it into the chain bracelet and create a lovely summer bracelet that is filled with color. Despite its intricate design, this is actually an easy bracelet to make and there are so many options regarding color and style. You could also use thin strips of fabric or any number of other materials to create this. I love coin rings for summer. They’re so vintage and really easy to make. The silver coins really show off some bling for the warmer months, too. Considering that you actually make these from real coins, they’re a bit more complicated than some of the other jewelry projects for summer on the list, but they’re still completely doable and really are perfect when you want something fun to wear to the beach or lake that won’t tarnish in the water. Paracord bracelets are great for hikers, who really step up their game during summer. 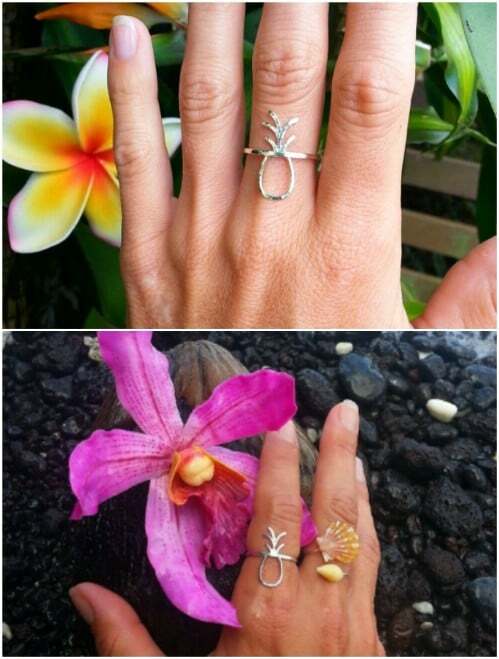 If you love camping and just everything outdoors, this is the perfect summer jewelry accessory for you. There are a few different ways to make these and all of them are pretty easy to do. 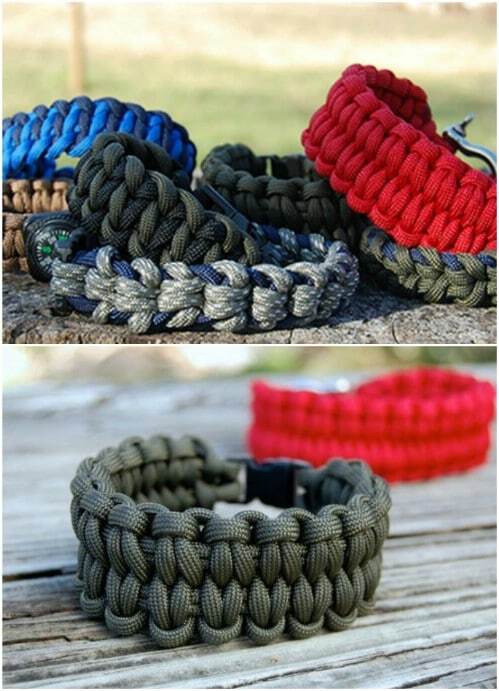 If you are planning a camping or hiking trip this season, these paracord or survival bracelets are a must and the materials are really inexpensive. If you’re going to the beach, or you’ve already been and have a few seashells on hand, this necklace is perfect. It’s a single seashell that is dipped in gold and then hung on a cord. 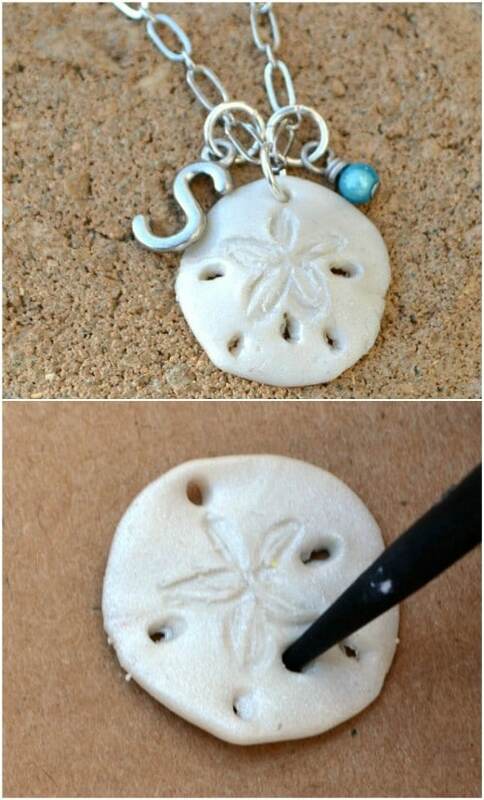 It’s really easy to make and is absolutely the perfect summer necklace since it centers on a beach theme. If you don’t have a seashell you can buy these at Michael’s or Hobby Lobby and they’re really inexpensive. You just have to have a great anklet for summer. Anklets are perfect for dressing up or heading to the beach and this one is super easy to make. You will need a few jewelry supplies and you can choose charms that you prefer. Hobby Lobby and other craft stores have tons of different designs that you can choose. I love wearing anklets in the summer to show off the tan and this one will only take you a few minutes to create. You can make this amazing braided cuff bangle bracelet in less than an hour and it only costs about $10 for the supplies. It’s made with memory wire and Hama beads, which you can pick up at any hobby or craft store. Since this is so cheap and takes so little time, you could make several of these in different colors to dress up all of your summer outfits. 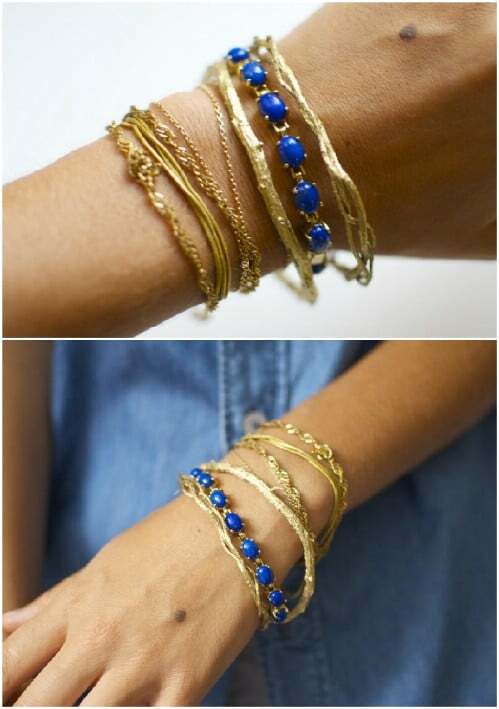 Or stack them to really make a fashion statement. This lovely ring is made from a guitar string so it’s comfortable to wear, plus it won’t tarnish in the water so it’s perfectly safe to wear to the beach, pool, or lake. 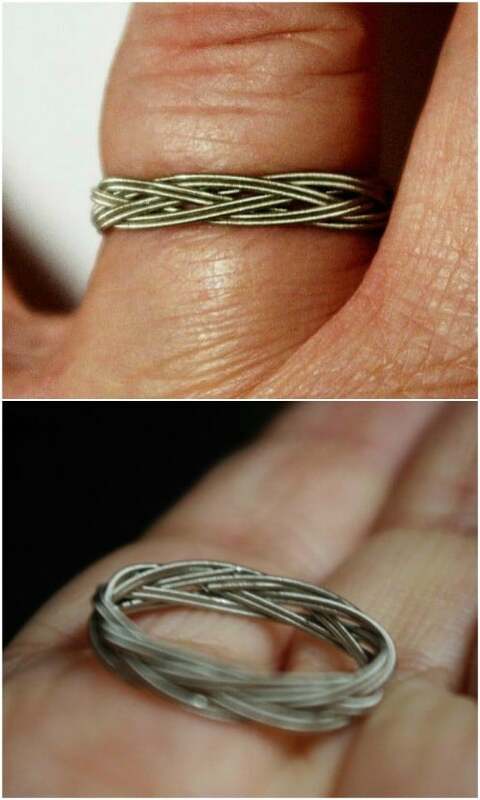 It’s pretty easy to make and guitar strings aren’t terribly expensive so this is also a really cheap ring. You’ll need to master the Spanish knot for this one, but once you have that down, the rest is really easy to do. 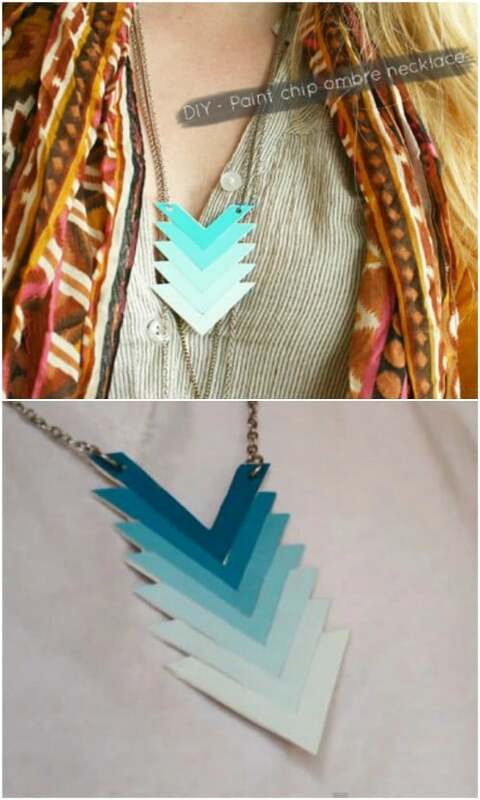 This Ombre necklace is made in a chevron pattern which is really popular right now. 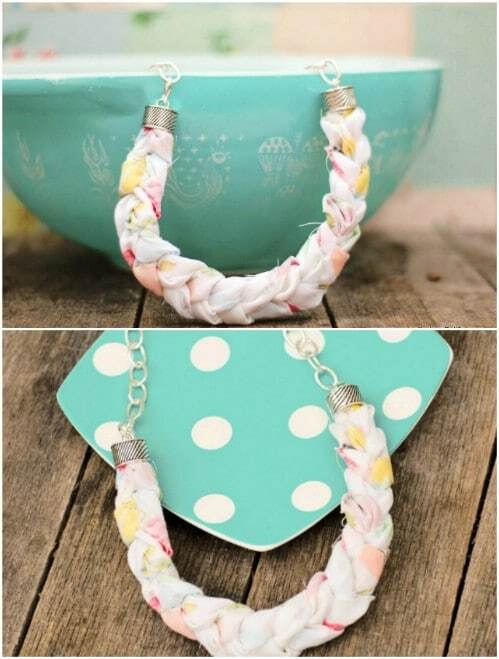 Due to the bright colors, it’s the perfect summer jewelry choice and it’s pretty easy to make. It’s made from a paint chip or sample that you can get at any home improvement store for under a dollar. Since the paint sample already shows the colors in different hues, the Ombre effect is really easy to achieve. What says summer more than beautiful flowers? 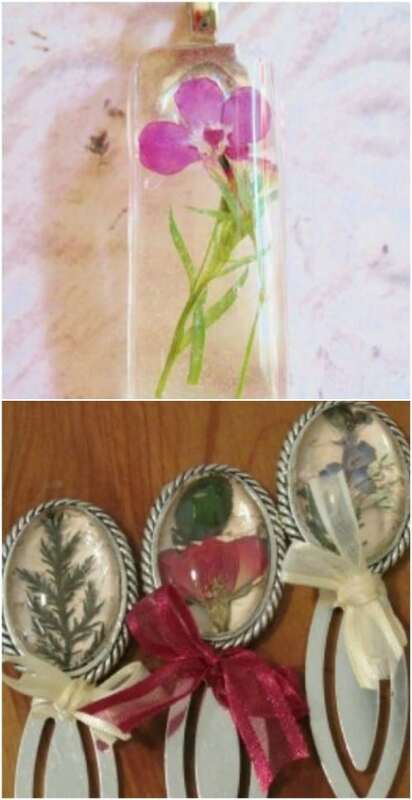 This resin jewelry is made from pressed flowers and it’s perfect for many reasons. The flowers and colors make it great for summer, plus there are so many options as to what you can do with your resin once it’s finished. 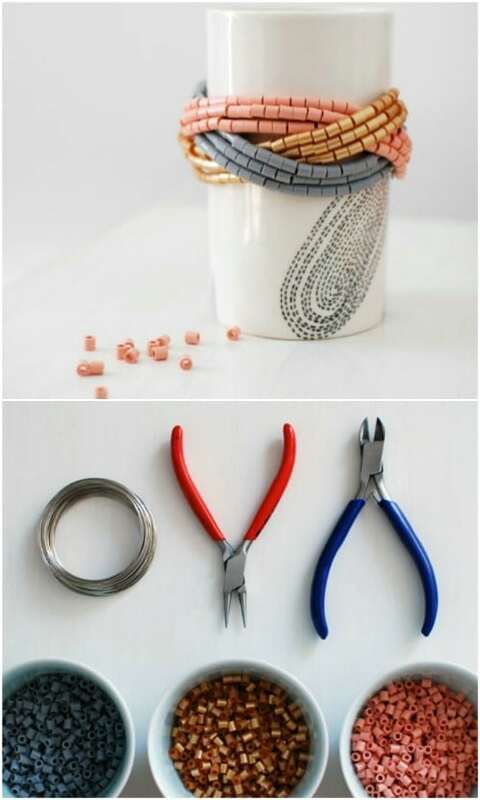 You can make necklaces, earrings or any number of other accessories. 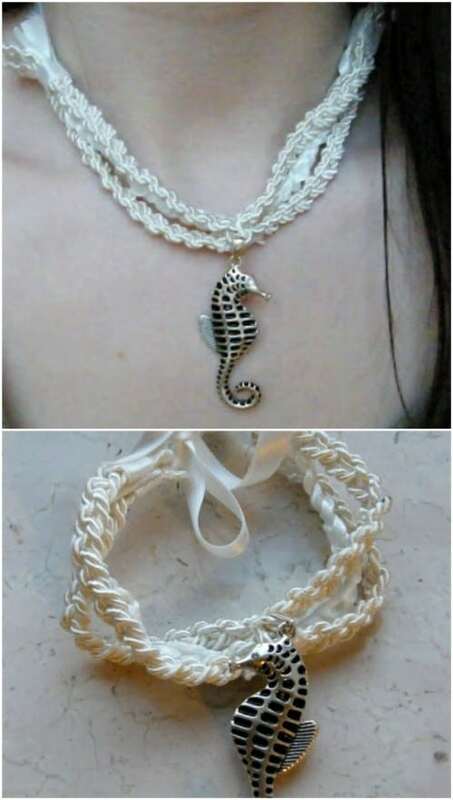 This little seahorse necklace is great for summer and it’s made from recycled plastic, so it’s also a wonderful repurpose project. You paint the seahorse with nail polish so there’s your chance to perfectly match any summer outfit. These are so easy that you could make one in multiple colors so you have the perfect necklace to adorn all of those summer wardrobe choices. Or you could create an entire little sea world with your plastic and make charm necklaces or bracelets. Remember those friendship bracelets that you used to make in elementary school? Well, the concept is back and it’s a really easy one. Friendship bracelets remind me of summer camp. They’re a jewelry choice that kids are going to love to make and they are so very easy to put together. You can do these in so many different styles and designs. Add beads if you want or just weave in multiple colors. The possibilities are endless! If you’re heading to the lake this summer, or if you’ve already been and just happened to have collected a few rocks, you can make this stunning lake rock necklace. 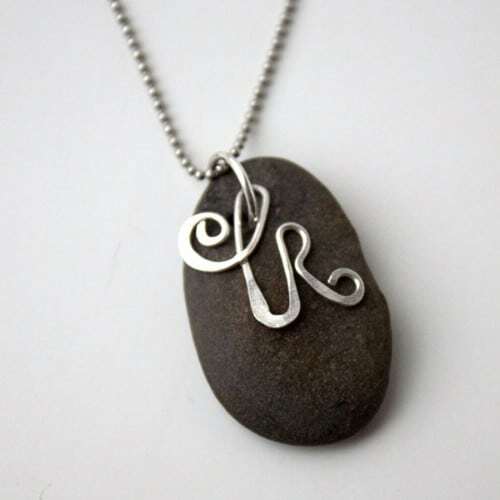 I love the idea of personalizing it with an initial, which you can make out of bent wire. The entire project looks pretty easy and it’s definitely a way to show off your summer travels. A sand dollar is definitely going to make a wonderful summer jewelry piece. Just look at this lovely sand dollar necklace. It has a sand dollar, plus a few colorful beads and the entire look is perfect for summer. You don’t even need a real sand dollar to make this. You can sculpt it from polymer clay. And, it takes very little time so you have plenty of time to get it done before you head out to the beach. This nautical rope bracelet is really perfect for summer. It’s really easy to make and has that great “I’m on a yacht” look to it. You’ll need rope of course and a few other supplies to make this one. It doesn’t take long though and since it’s such a simple bracelet, you could make several of these in different colors if you like the style so that you have something to wear with different outfits. Is pineapple the official fruit of summer? It should be, and this ring should definitely be on your finger when you head off to the beach this season. It’s hammered so that it shines in the sunlight and has the silhouette of a little pineapple. I ran across this one on Etsy and it’s available in a number of sizes and in silver or gold. 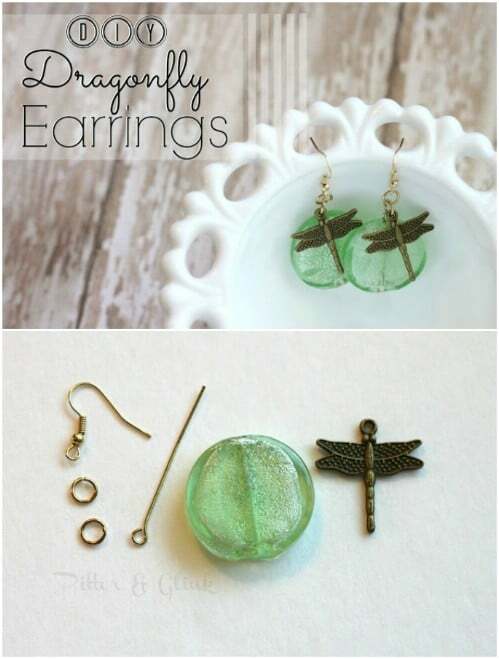 Dragonflies always make me think of summer and these little earrings are really adorable. 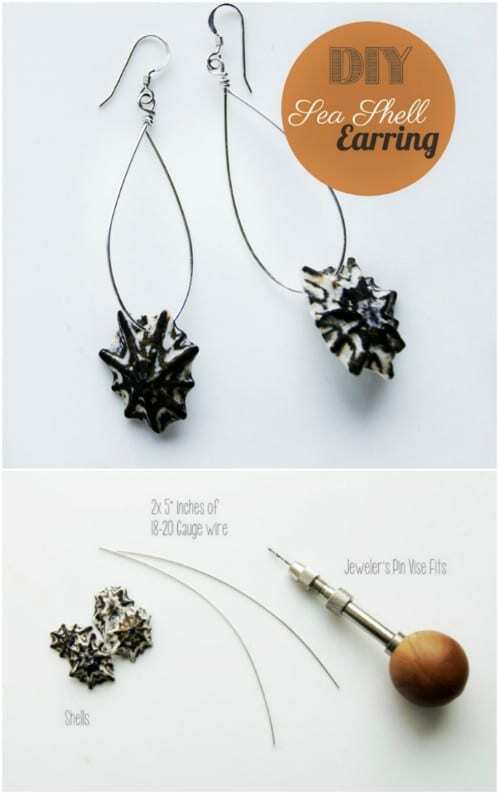 They’re also repurposed from other jewelry pieces, so they’re perfect for those of you who love a good repurposing project. You can also find the pieces that you need at most craft stores or even at Walmart. They’re bright and colorful and have those adorable little dragonflies, which make them the perfect summer earrings. 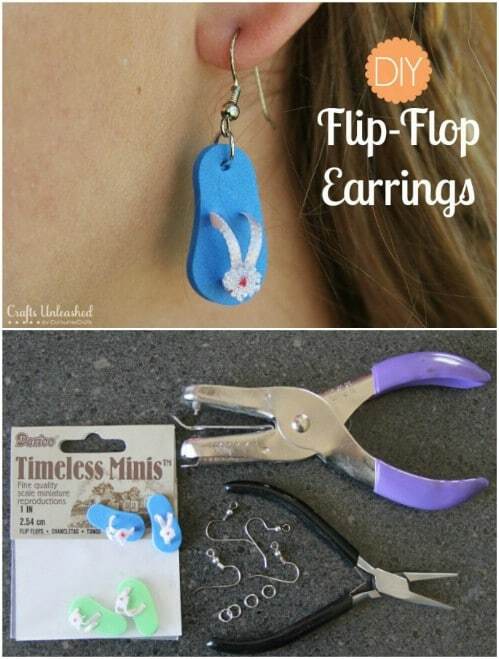 These little flip flop earrings will only take you about five minutes to make. They also only cost a couple of dollars and they’re the perfect summer fashion accessory. You can find the mini flip flops in craft or hobby stores or design your own and cut them out of foam. 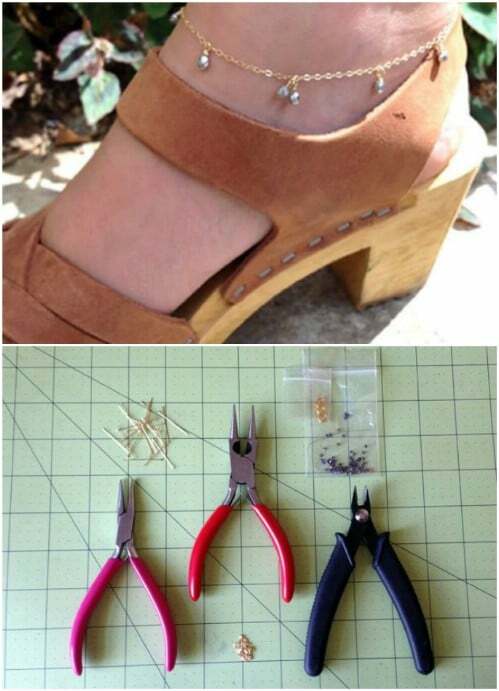 Then just add your decorations, an earring hook and you’ve got a lovely pair of summer earrings. 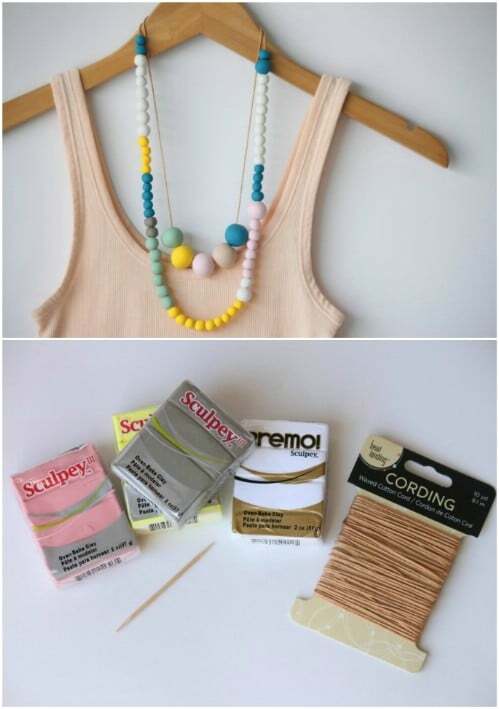 Use a brightly colored piece of fabric to create this necklace and it will be perfect for summer. You’ll need a few strips of fabric to make this and you can do it in so many different colors and designs. 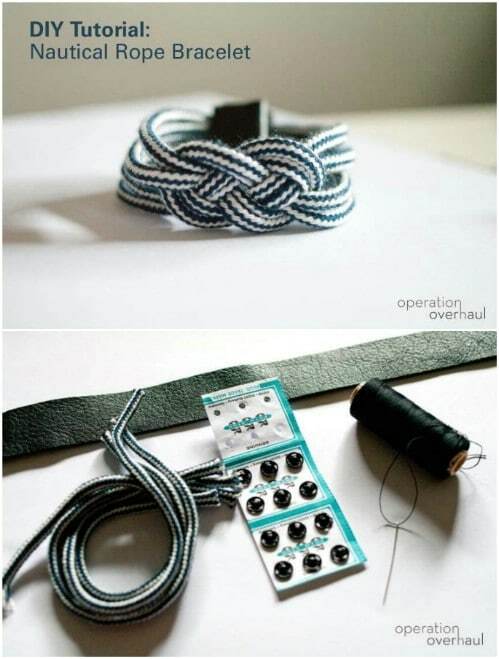 Just braid your fabric together and then add the necklace clasp. It’s pretty easy – easy enough that you can do several in different designs for the summer season. 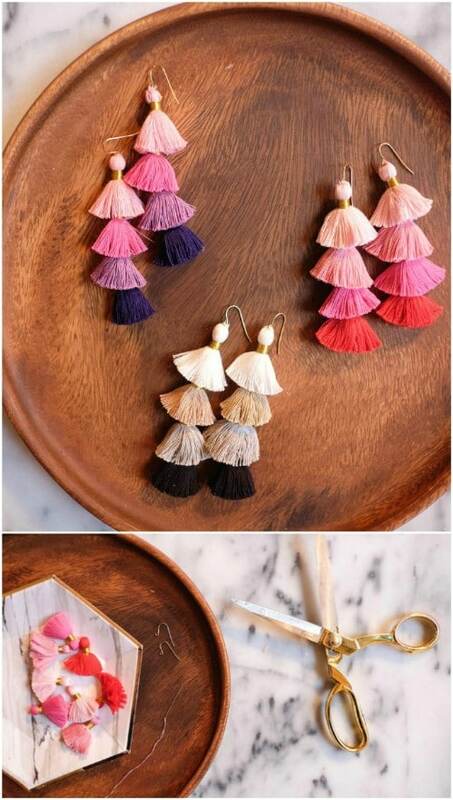 These little tassel earrings are great for summer. They’re lightweight and you can do them in so many different brightly colored pieces that they’ll match practically every summer outfit in your closet. They’re easy to make, too. You just use mini tassels which you can find at any craft store. 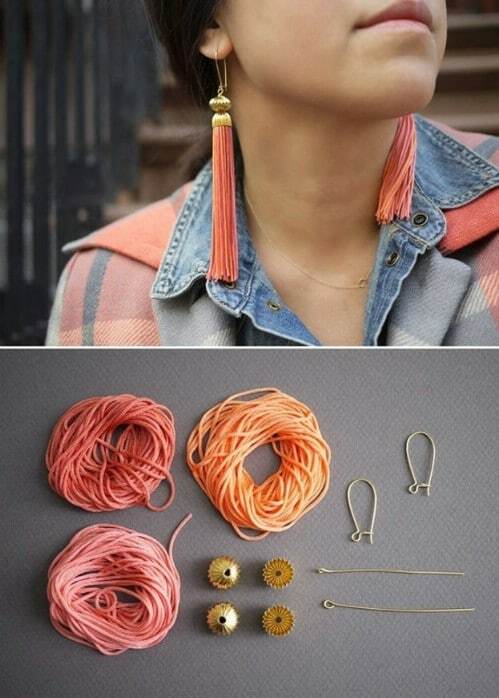 Join the tassels together and then add an earring hook. 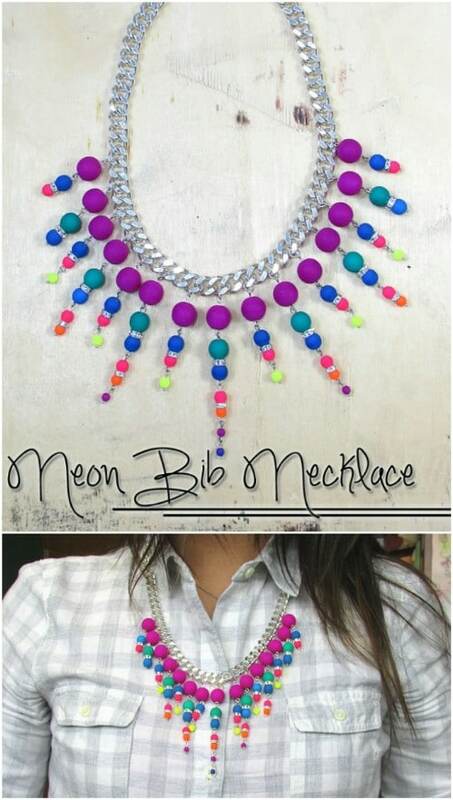 The bright neon colors of this bib necklace make it great for summer – and any 80’s parties that you may have coming up. This is a pretty detailed necklace so it’s not something that you’re going to make in five minutes. But, it does only require a couple of jewelry making techniques and when it’s finished, it’s a beautiful statement necklace. This nautical seahorse bracelet is adorable and so perfect for summer. 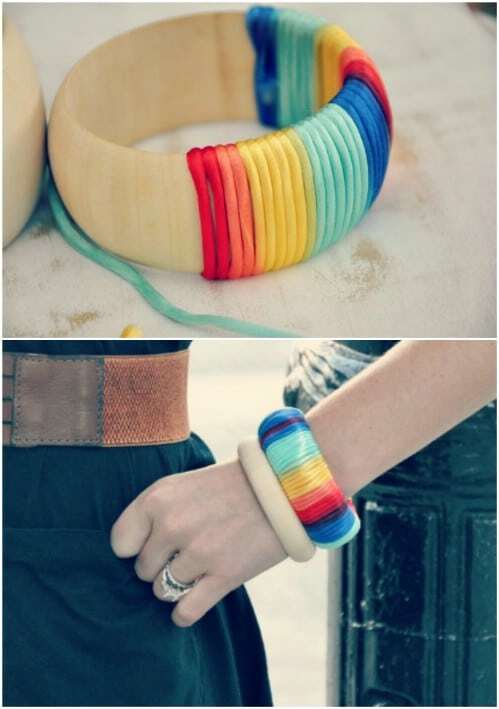 You can make it with any type of material – for the bracelet part – so it can be casual or formal. It also doubles as a necklace, depending on how you wear it. 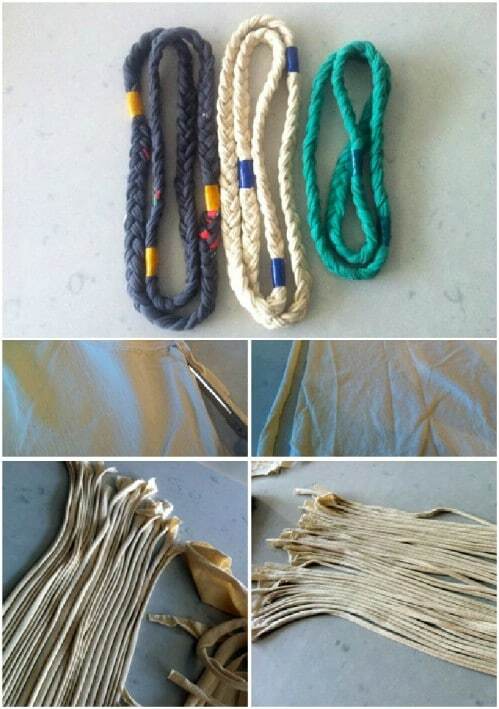 To make it, you use rope and ribbon, which gives it a really elegant look, and simply braid them together. 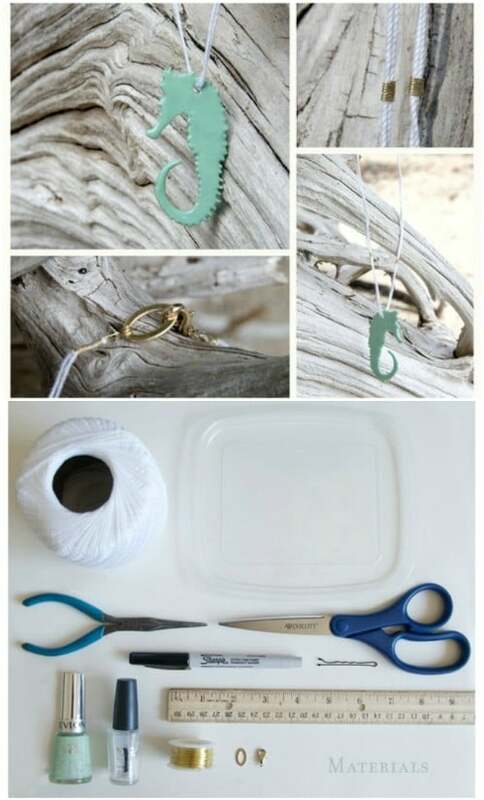 Then add your seahorse charm, which you can get at Hobby Lobby or other craft stores. This flower necklace is actually made from tiny seashells. 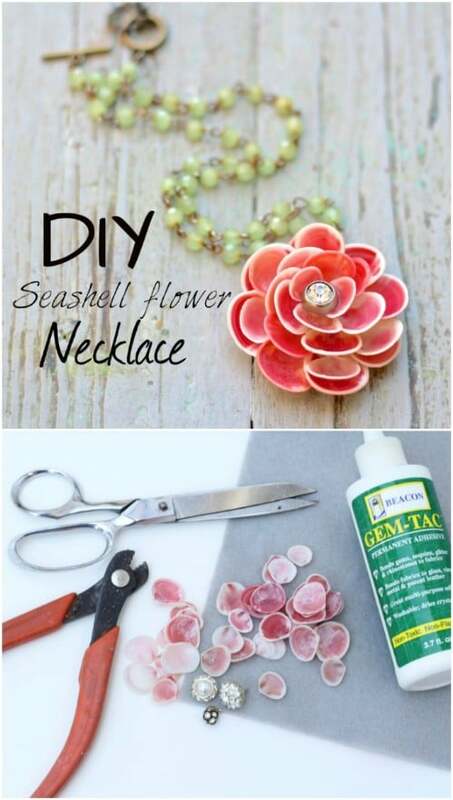 If you’ve been to the beach this summer and have a bag of seashells for crafts, this is the perfect project. Or, you can buy tiny seashells at hobby or craft stores. You use those shells to form a large flower, which really has a great tropical look to it, so it’s perfect for summer. Then attach to a chain or a set of beads and you’re all done. You’ve seen these necklaces in stores I’m sure – the ones that are small seashells with tiny pearls in them? I bet you didn’t know that you can make these yourself, and save all that money that you would spend on buying them. These are great for summer jewelry. They’re so lightweight and really give off that beach vibe. 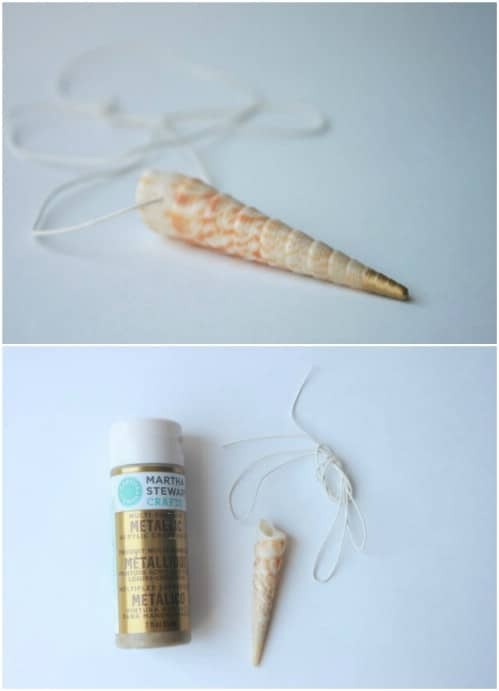 You’ll need a small pearl and a small seashell to make it and something to hang it on. It’s easy, cheap and will only take you a few minutes to complete. These little shell earrings are set in wire and they’re so easy to make. Seashells are perfect for creating summer jewelry and I really love the overall style of these shell earrings. To make them, you need the shells, earring wires and some thin wire to hang them. These are so great and would be perfect for casual or semi-formal events. Honestly, the only place I want to see bees is on jewelry. 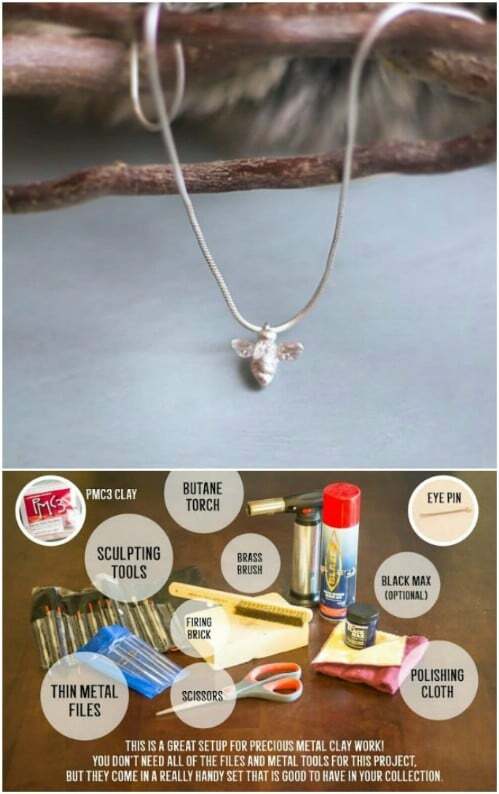 That being said, this little silver bee necklace is gorgeous and great for summer. 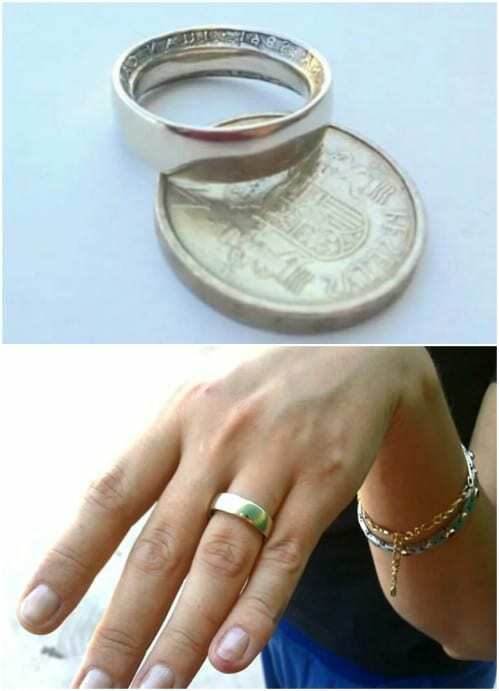 It’s pretty easy to make and you don’t even need any jewelry making skills. You just buy the chain and the silver bee pendant and then put them together. It’s simple and doesn’t cost much. You can find the supplies at any store that sells random jewelry supplies. What could possibly be more summer inspired than this starfish cuff bracelet? It’s so pretty that you’ll want to wear it all year long and it doesn’t take long at all to make. 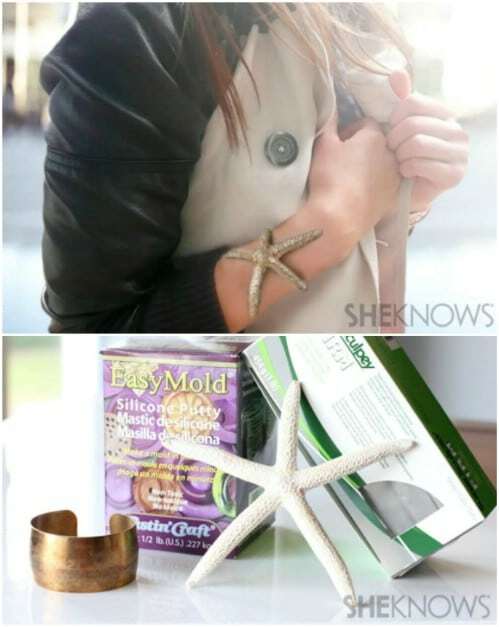 You mold the starfish out of putty and then form it around a cuff. It’s a gorgeous bracelet that is certainly going to grab attention at the beach or anywhere you want to wear it. Here’s another great pair of tassel earrings that are perfect for those summer wardrobe picks. For these, you make the tassels yourself out of embroidery floss. Just fold it over and cut it to the length that you want. These are pretty simple to make and will look great with your bikini at the beach or a dress if you’re planning a night out on the town. Plus, you can do them in whatever colors you need to match your favorite summer outfits. 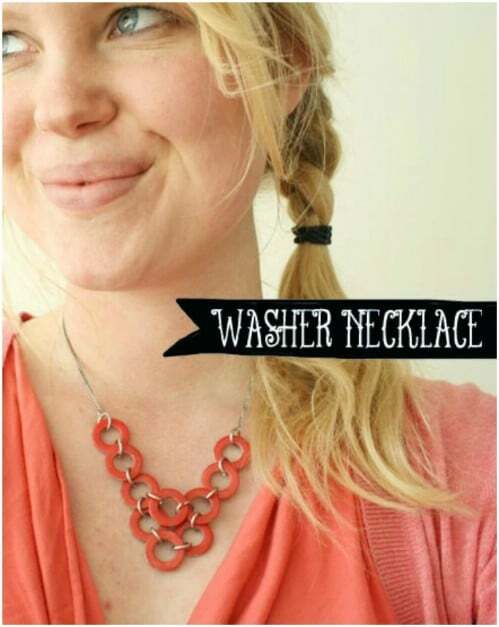 Who knew that a bunch of washers could be turned into an amazing necklace? This is so great because you choose the color that you want the necklace to be. The design is amazing and perfect for pairing with any summer outfit that you plan to wear. You paint the washers with nail polish and overall, this is a really inexpensive statement piece and won’t take you long at all to make. You need a great ring to make a summer statement, right? 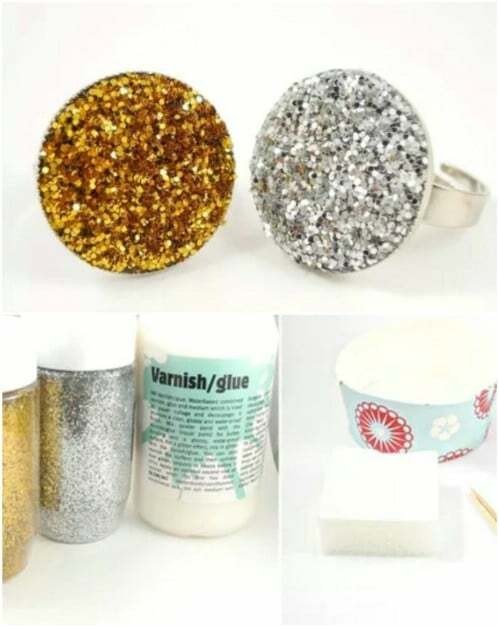 Well, this glitter ring is perfect for that and it’s a really easy ring to make. You need to have an adjustable ring with a setting pad and then you use glitter and varnish glue to create the stunning design. Do these in different colors and have something to pair with all of your summer outfits. They’re so easy and don’t cost much at all to make. Clay beads are great for summer. They really match the season perfectly, especially when you choose multiple colors for your jewelry pieces. This polymer clay bead necklace is great to wear with just about anything in your summer wardrobe and since you sculpt the beads yourself, you can do them in all different sizes and choose colors that you want to accent your favorite summer outfit. Don’t you just love the old neon jewelry from the 80’s? I do and that’s why I really adore this neon rope cuff bracelet. You take a standard cuff bracelet and then wrap rope around it, gluing it down as you go. You can then embellish your neon cuff with any number of summer charms from seashells and starfish to a flag for the Fourth of July. 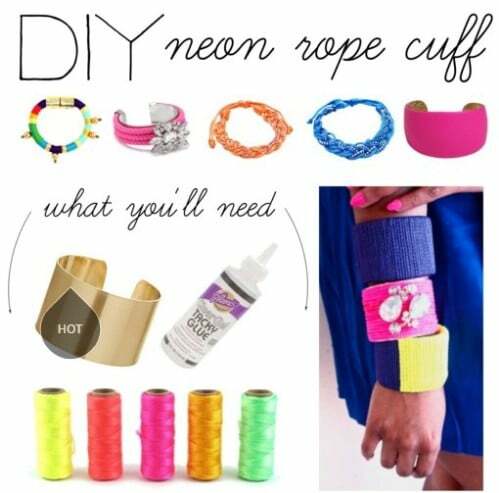 These are really easy and inexpensive to make and perfect for those of you who love bright neon fashion. Leather jewelry? I love it! 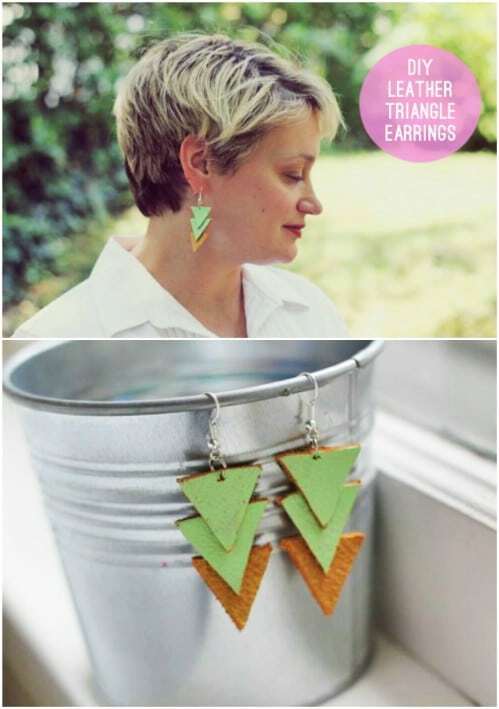 And these earrings are so easy to make. They’re colorful – if you choose bright colors, that is – and really lightweight so they won’t be uncomfortable while you’re out enjoying all those summer activities. They’re also perfect for work – since we all have to work during the summer – or an evening out on the town. And, you can make them in a dangle or stud style. that it stays in place. 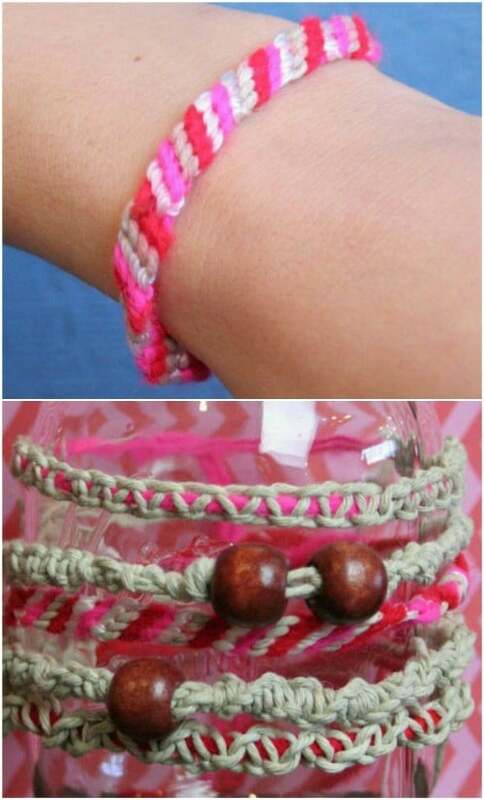 This is one of the easiest bracelets to make for summer and one of the most colorful and tropical. I love the bright colors and the fact that you can make this in less than an hour. ot even that difficult to do. You’ll need to cut the shirts into strips of fabric, which you then braid to get that great nautical rope look. Wear them plain or add your favorite charm. These bangle bracelets are actually made from twigs – that you find outside in your yard! Bring in your twigs and then paint them with gold spray paint. Once the paint dries, you want to wrap the ends together and glue the thread so that the bracelet maintains its round shape. Then you can add beads or just wear them as they are. These are so perfect for summer crafting and look lovely with that beachwear.